Acer has introduced the Aspire S3, an ultrabook that will start shipping this month and cost from €799 (US$1,134), the company said during a launch event at the IFA consumer electronics show. The growing number of so-called ultrabook laptops -- which aim for high performance in a very slim form factor similar to Apple's MacBook Air line -- is the result of Intel wanting to help revitalize the struggling PC market. Intel's low-power but high-performance chips are being used by vendors including Acer and others. "We always challenge each other," said Campbell Kan, who is in charge of PC Global Operations at Acer. Acer's contribution to this movement is the Aspire S3, which has a 13.3-inch HD LED display, which has become the norm on ultrabooks. Users can choose between traditional hard drives or solid-state drives. The Aspire S3 is powered by second-generation ultra low-voltage Core processors from Intel. Consumers will be able to choose between Core i3, i5 and i7, according to Acer. The chassis is made from an aluminum-magnesium alloy. Acer has made efforts to improve start times when waking a computer from sleep mode as well as battery life. The device should be up and running in less than two seconds, and when in deep sleep mode the battery should last for up to 50 days, according to Kan.
Users should also be able to place the Aspire S3 in their laps without burning your thighs, because Acer has placed warm components away from the bottom of the unit and also where hands are usually placed. An important part of any ultrabook is size and weight. The Aspire S3 weighs 1.3 kilograms and measures 17 millimeters at its thickest point. Those numbers should ring a bell for owners of the MacBook Air, which on some models has a 13.3-inch display, is 17 millimeters thick and weighs 1.35 kilograms. 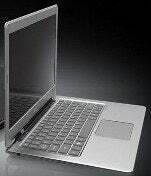 Acer's attempt at a cost effective Ultrabook ultimately cuts too many corners.